Business Bay’s The Trip promises a one-of-a-kind cycling class. We love getting all geeky over a new bit of tech, and Dubai prides itself on being one of the most technologically advanced cities in the world. The arrival of The Trip by Les Mills, the international fitness company, is promising one of the most intriguing exercise classes we’ve seen for quite some time, and the video below looks like it’s worth getting excited over. 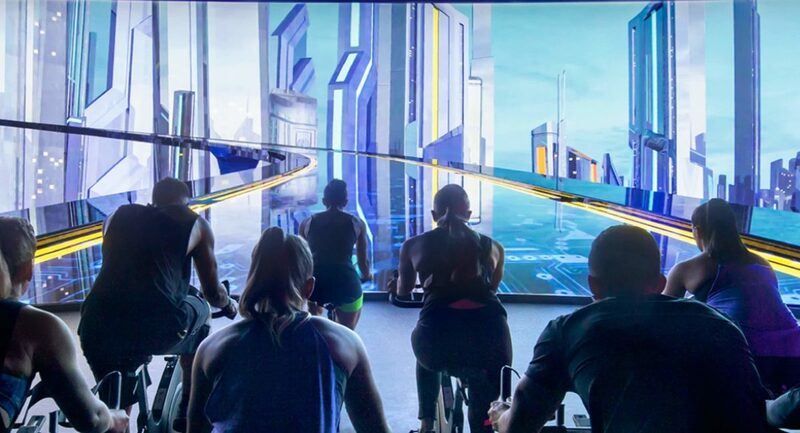 The Trip is being positioned as a virtual reality spin class, where participants immerse themselves on a fast-paced, digital journey. It’s designed to be a high-intensity workout, combining bursts of sprints with periods of rests as you prepare for the next part of the journey. Cramming the whole experience into a 40-minute workout is supposed to deliver a range of benefits, which includes burning calories long after finishing the workout, burning fat quickly and getting leaner faster, and the convenience of taking as little time possible for an intense, all-round workout. Research published by the American College of Sports Medicine claims immersive workouts can mask how hard your body is working, making it feel easier and helping you work out for longer. The first studio in the UAE to host The Trip will be at GFX in Business Bay, but plans are underway to bring the class to more studios in the coming month, including Talise Fitness at Madinat Jumeirah. What’s more, the first class is free, while packages start at Dhs 90 per class plus VAT.